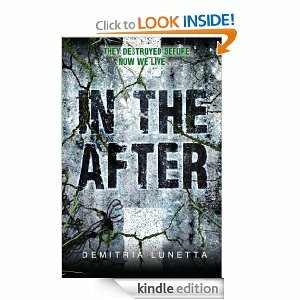 In debut author Demitria Lunetta’s heart-pounding thriller, one girl must fight for her survival in a world overrun by violent, deadly creatures. Perfect for fans of New York Timesbestsellers like The 5th Wave and Across the Universe. First of all, HUGE THANKS to Demitria Lunetta for having a twitter giveaway right before the release as that’s how I won my copy. Anyways–I loved this book! I couldn’t put it down. In fact, I was reading it on Christmas Eve and carried it to my family Christmas because it was either that or not go. I didn’t really know much about what the book was about going into it, but I was excited because of all of the positive feedback. Characters—I really liked Amy. She never gave in–even in the Ward, she tried to stand her ground and be strong. She had a good “voice” that kept the story going at a strong pace. The language she and Baby made and their relationship made for a great addition that added more emotion. However, New Hope is where the story really got going. It was interesting to see how the city worked, what was going on, and to learn what had really happened…and who had caused it to happen. I loved the relationship between Amy and Rice, so I’m hoping that, somehow, that builds in book 2. In fact, there are a lot of things that I’m hoping happen in book 2. I JUST finished the book and I’m already waiting and counting down until the release in June. I’m just hoping that it is as exciting and creepy as this one. I keep saying that I’m going to quit reading Dystopian books. They’ve been so overdone the last couple years, but I’d been wanting to read Legend for awhile, so I gave it a try and was not disappointed. Going in, I didn’t even know much about Legend–just that I kept hearing good things about it. Legend starts out with action immediately. That’s the kind of thing I need when I’m starting a book that I don’t know anything about! The action rarely lets up and holds the reader’s attention to the fullest. I previously wrote about the alternating point of views. I enjoyed getting to know what both Day and June were thinking and it was the perfect way to keep the story flowing. I’m not going to keep this long since I’d already posted a mini-review on it, but I will say that I kept enjoying it and that I do highly recommend it. 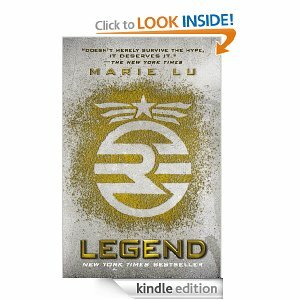 Legend is currently $2.99 on kindle, so it is a great deal for an amazing story! My next read is Between the Lines by Jodi Picoult and Samantha Van Leer. I got this one on my kindle months ago and forgot about it until I purchased it for my library recently and got to flipping through it. That post should come soon since I’m off work for the next two weeks! …gotta love teacher/school breaks! What are you Christmas reads? I sat completely content for about 4 or 5 hours read it straight through. I immediately wanted to read its companion, The Fallout, but I let other books come first. My ONLY complaint is that I now want another “what happens next.” At the very least, I want a novella or something. Is it too much to ask? The Compound got me so invested in these characters that I genuinely do what to know what happens to them! I’m not nearly as connected to most book characters as I am to these. It was just too interesting for me not to know. I’m almost done with Legend and still love it! That said, I’m trying to decide what is next. I’m not buying anything new until I whittle my TBR pile down a bit. My next book will then have to be something I already have or a netgalley arc. Anything I should choose first? So this isn’t a review as much of a reflection seeing as how I’m not yet done with the book. I just have to point out a few things about Legend. A certain book (that I won’t call out) recently caught flak for the way it had alternating narrators but was lacking in differences between the two voices. Legend is not like that at all! Sure, each chapter names the narrator and there are visual differences, but there are strong differences in characters to the point that I would know who is narrating even if the chapter heading did not tell me. I’m almost tired of dystopian novels, but this is quickly redeeming the genre for me. The world is harsh and the reader can sense the excitement and danger.